Our second trip to Normandy was an even more exciting adventure! The weather was not only on our side but the cuisine was as well. Delicious food and perfect weather is an ideal combination for me on any trip. The backdrop for the day was the architecturally stunning town of Rouen (the capital of upper Normandy). 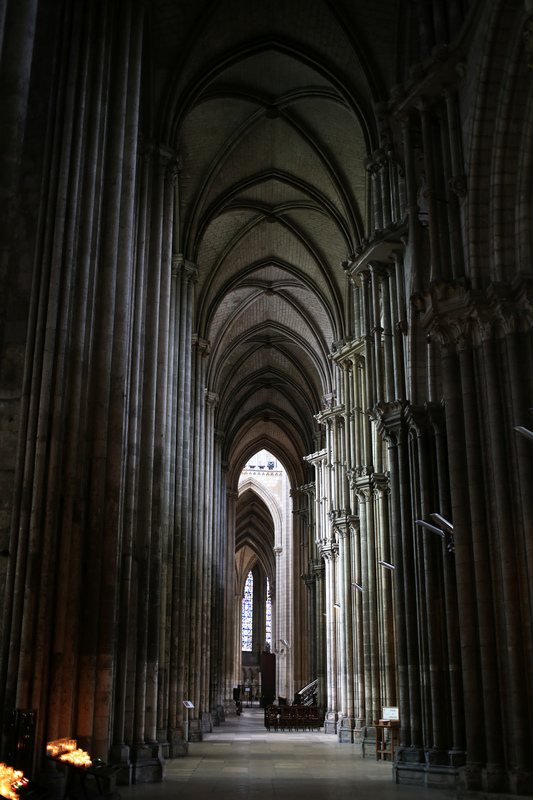 From venturing inside the Cathedral Notre-Dame de Rouen to tantalizing our tastebuds at "Le 6ème sens" restaurant, it was an overall successful trip. There was nothing like the slivers of stunning alleyways, automotive treasures lurking in private driveways, and intricate architectural details. We even stumbled upon a flea and farmer's market that had some of the most striking fruits and vegetables that I have ever seen. Throughout my travels in France, the vibrant colors of these local delicacies and robust flavors never ceased to amaze my palette. The array of trinkets, furniture, and clothing also caught my attention immediately. As an avid thrifter, I was drawn to this supple toffee-colored leather backpack that is a staple summer accessory. After much indecisiveness and stents in the mirror, it came home with me and is ready to take on some exciting adventures and to appear in upcoming posts these last few weeks of summer!